Chinese class at ARHS is home to a few select students that have been with their teacher and peers since middle school, leading to a strong community, comfort, and challenge. Their teacher is Yiping Yan. Ms. Yan majored in Chinese language and literature. She attended East China Normal University. “It was an ‘educational school.’ Students went there to become college and high school teachers,” she said. Ms. Yan went on to teach Chinese in China for 10 years. She then moved to New Jersey with her husband, and lived there for about a year. Then she attended UMass, where her husband worked,and received her master’s degree. In 2003, she started teaching at ARHS. 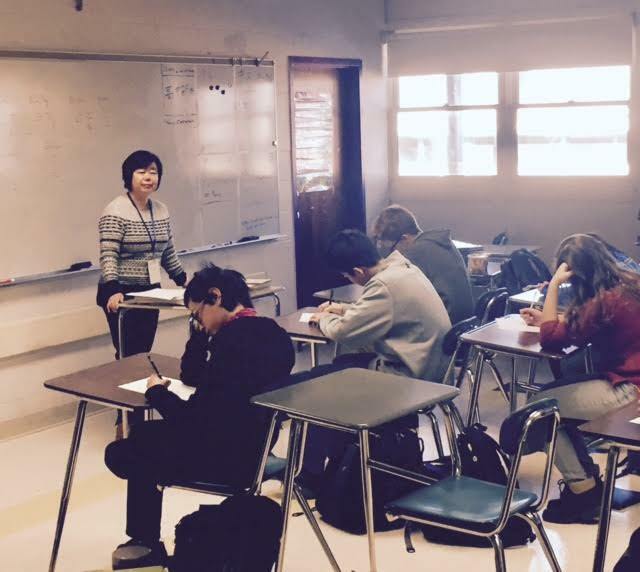 Ms. Yan, being the only Chinese teacher, gets to work with the same students for four to six years, so she has great relationships with her students, who include Ryan Dinger, Maxwell Hopley, and Noah Zobel, all seniors who have taken Chinese since seventh grade. “Chinese was the obvious choice. It’s the most common first language in the world,” said Hopley. All the students are fairly close to one another, being in the same class for five years. “We are like a big family,” said Ms. Yan. There are four different Chinese classes, one for each grade. Students are taught Mandarin Chinese, simplified, and are taught to write, read, speak, and listen. “People take Chinese because of its long history, and people find the language and culture very fascinating,” said Ms. Yan. She describes that learning Chinese is both important and desired by many individuals. “I think that Chinese culture is very unique; this sparked my interest. They have traditions that are uncommon in the rest of the world that are intriguing to learn about,” said Dinger. According to Chinadaily.com.cn, the reasons why people are attracted to China include its language, its food and music, and its overall society and way of living. “I really like Chinese food and the one-child policy,” said Zobel. “I think Chinese history is pretty cool, too, though that stuff didn’t impact my decision to learn Chinese at all, said Hopley. “There are lots of Chinese people, and lots of economics in China,” Ms. Yan said. According to the Boston University Department of World Languages and Literatures, China is the most populated country in the world, with more than 1.3 billion people living there. Mandarin Chinese has become an essential language to have in marketing, since there are so many Chinese speakers. “I heard that China was going to rule the world by 2030, so I thought it’d be a good idea to learn to speak the language of the world leaders,” said Zobel. Ms. Yan said that the students who take Chinese have parents or relatives that have been to China, or are simply interested in the culture. “It is very unique to other languages taught at ARHS,” she said. Although Chinese is a fairly popular language to learn among Americans and originally non-Chinese speakers, some avoid it due to its difficulty. Zobel had a similar opinion. “You have to learn Pinyin, tones, and characters; it’s like triple the work of every other class, and people are lazy so they don’t want to take a language with more work involved,” he said. Students may also not see the necessity of learning Chinese. Its extreme differences from the romance languages make it a language that seems illogical to study. “It is uncommon around these parts because I think people don’t see how they could apply this knowledge. Spanish and French feel like they are more applicable to more situations we encounter,” Dinger said. Chinese has been cut from ARMS, and is no longer available for middle school students. There are not many students enrolled in Chinese, making it more and more difficult to keep in the curriculum. “I fully support Chinese at ARHS,” said Principal Mark Jackson. However, because the middle school no longer offers Chinese, there will no longer be a source of new coming students learning Chinese. Despite ARHS allowing students to take Chinese as freshmen, according to Mr. Jackson, no ninth graders have ever enrolled.